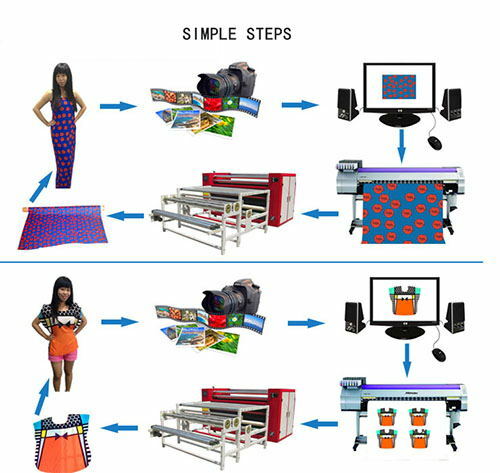 What's the Reqyuirements for Sublimation Digital Printing Process? In the transfer printing process , first , we should print the pattern on the sublimation paper . and then use the heat press machine transfer the pattern to the fabric though the high temperature . in this way , Reproducibility for printing pattern transfer printing paper surface polymer material transfer plays a key role. Especially in the back of the transfer process, to maintain the pattern of flower pattern vivid, meticulous, clear, strong sense of three-dimensional characteristics, the performance of transfer printing paper is relatively high, mainly include the following. First, the paper is required to have sufficient strength, the paper surface does not lose hair, powder off. As the printing ink is carbon black or other pigment particles evenly dispersed in dry oil, animal glue or resin made of. In the printing and stripping process, ink and paper surface there will be a certain tension, the faster, the greater the tension. So the paper surface is required to have sufficient strength. The transfer paper is preferably made of softwood pulp.The speed most fast , the tension will more strength . This ensures that the sheet has sufficient strength. But also make it in the high temperature treatment will not brittle, yellow. Again, the transfer of printing paper on the color ink affinity is small because the transfer of printing paper is only an intermediate transfer pattern, the ultimate goal is to require a clear transfer to the print surface. So that the smaller affinity will make the pattern easily transferred from the surface of the transferred paper to the printed surface. Will not be too much on the sublimation transfer paper and the printed pattern of quality caused can ignored. Previous:Why Mimaki Eco-solvent Printer Such Popular in Digital Printing? Next:What's the Reqyuirements for Sublimation Digital Printing Process?